Allyson Worthy, daughter of the renowned homicide detective Christopher Worthy always dreamt of living in Venice. Now, as a college student, she's landed a dream internship with the Venice police. She assumes she will be investigating minor crimes perpetrated on gullible American and English tourists. On the first day of her internship, however, Allyson is assigned to assist with a more bizarre case--the apparent suicides of two wealthy Americans in the city. Linking the two persons are their similar cancer diagnoses and strange incisions on their bodies. The family of the second victim, a Detroit automaker, doubt the suicide verdict and hire Christopher Worthy to look into the death. Allyson's relationship with her father is tenuous, and she resents his intrusion into her dream summer. After speaking at a conference in Rome, Father Nicholas Fortis is asked by the Vatican to look into the recent theft of relics, bones of saints, from Venetian churches. Father Fortis is happy to offer whatever advice he can to the case Christopher and Allyson Worthy are working on, even as the two Worthys are happy to advise Father Fortis on the stolen relics case. An unexpected breakthrough reveals a dark undercurrent in the city of canals that changes approaches to both cases. As clues fall into place, Allyson is unexpectedly put in danger as she unknowingly agrees to rendezvous with the killer. 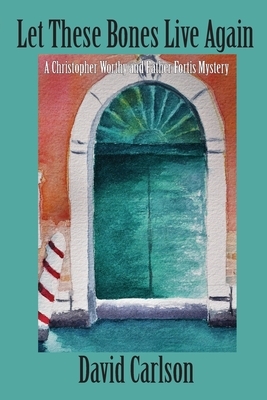 Book 3 in the Christopher Worthy/Father Fortis Mystery Series.